My name is Dr. Karl R.O.S. Johnson, DC and I am a Board-Certified doctor of chiropractic. I am a graduate of the American Functional Neurology Institute and I hold fellowships with the International Chiropractic Pediatric Association and the Institute for Human Individuality. A couple of years ago I wrote and published my first book; Reclaim Your Life; Your Guide To Revealing Your Body's Life-Changing Secrets For Renewed Health. I am also excited to announce that I have added a new education designation. I now have a doctorate in pastoral medicine and science (PSc.D) from the Pastoral Medicine Association (PMA - www.pmai.us). PMA providers have one thing in common and that is they believe that while conventional medicine has an important place in saving lives, following the life giving instructions of our maker will help us avoid much of the chronic poor health and disease that plagues mankind. I provide members of the Member Share Network, which is free to join, with natural health care services. The Member Share Network is the gathering place where licensed ministerial providers come together with member families to share in natural concepts for the physical, mental and spiritual aspects of health. You can learn more about the Pastoral Medical Association by visiting www.pmai.us. Now let me tell you the story about how I was driven to help others with chronic health challenges. My mother and dad both had autoimmune disorders and as a result of digging deep to determine some of the causitive factors I discovered some interesting, but disturbing details. My mother had rheumatoid arthritis, Hashimoto's and colitis. My dad had Parkinson's diease, as did his father and mother. My grandmother died with dementia as did my mother. When you have a health history like I do, you either decide to let the chips fall where they may or try to change the future by making changes where you can. Once I discovered a common denominator for all these family health challenges, I decided to make it my mission to help individuals heal themselves. That common denominator was the inheritance of a celiac gene and a gluten gene, which when found together means the person with such genes is heavily predisposed to immune reactivity to gluten. In other words gluten ( and other proteins that look similar to gluten) can be subject to immune system destruction. Sadly many proteins that make up our organs and tissues look like gluten too. In my case, my immune system was already targeting my thyroid and gut by the time I discovered this news, which necessitated an immediate change in my diet if I was to have a fighting chance of changing the trajectory of my future health. In my mind there was no other choice and I immediately implemented the changes necessary to take the food triggers out of my diet. As a holistic health practitioner I have worked with people all over Michigan and in other states, as well as Canada, to help them discover that their health conditions are not the problem, but are rather symptoms of deeper imbalances occurring in the body, mind, spirt, or lifestyle of the individual. Once we can uncover the deeper underlying issue causing the symptoms we experience, we can begin to properly treat and actually heal the imbalances that are manifesting through the chronic fatigue, fibromyalgia, autoimmune disorder, or any other negative health condition that causes us to suffer. Since western medicine hasn't found a "cure" for Fibromyalgia, you've got nothing to lose by considering the information I'm about to share in this article. Assuming you are willing to give my concepts a go, lets begin by taking a look at how you have been perceiving the disease in your mind. First, are you seeing the disease as a diagnosis that the doctor gave you with no cure? Second, are you seeing that this disease has happened to you and now you are wounded, and to a certain degree, helpless about your health conditions? As long as this type of thinking rules your mind, which I like to call a "victim" or "wounded" consciousness, the ego will retain a nearly unbreakable grip on your suffering and will not allow you to heal. However, by simply reading this article you are declaring yourself open and willing to examine your relationship to your disease, and you are taking the necessary "first step" towards living beyond the symptoms and into a place of thriving. How do you begin to shift your mindset away from suffering and towards healing? Perhaps one of the most important action steps you can take to optimize your health is by remaining in a space of commitment to your health. In my case, I opened myself up to being more resourceful and creative in finding a better way to work on improving my future and dealing with the health challenges I found my body with which I was afflicted. Next, I began with the approach of looking at all the areas of my health that I can control, from my sleep schedule, to my happiness, to most importantly, my diet. As I coach patients and members with fibromyalgia and CFS and other health challenges, including those with autoimmunity, I am observing phenomenal results when my patients and members remove the following five food groups: gluten, dairy, sugar, corn and soy. Through genetic engineering and cross-contamination, many foods containing these ingredients are highly inflammatory and can literally cause the body to attack itself, resulting in autoimmune disorders and conditions like fibromyalgia and chronic fatigue syndrome. Not only is it necessary to eliminate certain foods and ingredients that are literally toxic to us, but it is also important to begin to introduce certain healing foods and ingredients that can reduce debilitating symptoms and quite possibly heal these conditions all together. GREEN TEA The USDA Phytochemical Database reports that green tea contains compounds are rich in anti-inflammatory factors. 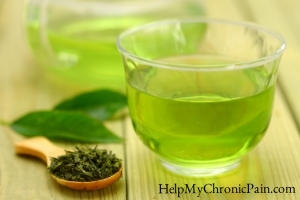 Green tea contains salicylic acid, a naturally-occurring COX-2 inhibiting compound (COX-2 being a major inflammatory pathway), that inspired the creation of acetylsalicylic acid, or aspirin. Green tea is also highly "synergistic," meaning that when combined with other healing herbs like Turmeric, has a three-fold increase properties of a common component in turmeric called curcumin. HOLY BASIL Holy Basil is highly revered in the Ayurvedic healing traditions of India. A phytonutrient contained in Holy Basil called ursolic acid was recognized for its anti-inflammatory properties by Dartmouth Medical School. Holy Basil also has noted radio-protective benefits. TURMERIC The health benefits of Turmeric are legendary and now well known among everyday vitamin and herb consumers. Indeed an entire article (or book) could be written on Turmeric alone. The key about turmeric that I have discovered is that the method of extraction is extremely important. Many supplement manufacturers offer highly processed and "standardized" doses of turmeric, containing highly concentrated mega-doses of a single constituent called curcumin. Unfortunately these mega-doses standardized extracts take on a "biphasic" pharmaceutical effect and can sometimes be less effective than an extract that reflects the full complexity of turmeric with its many constituents besides just curcumin. For this reason I only recommend broad spectrum turmeric extracts like New Chapter's Turmeric Force or Zyflamend products. BAIKAL SKULLCAP More and more research is emerging every day regarding the profound anti-inflammatory properties of Baikal Skullcap, or scutellaria. As inflammatory conditions are diseases of imbalance, Baikal skullcap reigns supreme in its ability to both quench the fires of inflammation and promote the healing of damaged tissue. In addition, it was reported in the prestigious British Medical Journal that scutellaria contains high concentrations of melatonin, a hormone with numerous beneficial properties for both healthy sleep and cell protection. OREGANO Oregano contains over 30 known anti-inflammatory components, 28 anti-oxidants, and four known COX-2 (inflammatory enzyme) inhibitors. With a super-pure, super-potent, broad-spectrum Oregano extract, all of these healing components are at your service to help quell damaging inflammatory episodes. GINGER Ginger contains nearly 500 known constituents, many of them noted for their profound inflammation-balancing activity, all working in a complementary fashion with one another for a beneficial biological effect. When considering a ginger extract or supplement to incorporate into your daily regimen, it is important to select an extract that contains this entire spectrum of plant phytonutrients that naturally occur in ginger. This is why I only recommend New Chapter's Ginger Force, because New Chapter is the only brand that I know that creates a "dual-extract" of their herbs. One extract obtains all of the water-soluble components of the herb, a second "supercritical" extract obtains all of fat-soluble components, to ensure that the final product contains the full spectrum of ginger's constituents. Of course, it should go without saying that all individuals have uniquenesses that need to be taken in consideration when developing a health optimizing program. To optimize our health many factors need to be looked at to insure a thorough investigation to reveal underlying factors which can decrease our expression of our God-given inborn healing potential. I look at each individual as a unique snowflake and strive to open up the padlock which is keeping your health locked up inside. The best way I know how to begin the journey of healing is with a case review to evaluate neurological and metabolic factors contributing to ones ill health. What is Included in The Johnson Neuro-Metabolic Therapy Case Review? A consultation with me, Dr. Johnson, to discuss your problems and concerns. (This can also be done via telephone or webcam) A complete case history and health questionnaires. A dietary and nutrition evaluation. A complete analysis of dietary habits (based on what you submit). In addition I am going to analyze your current supplements, herbs, natural medicines, botanicals, and homeopathic’s to determine whether they are beneficial or actually detrimental to your condition (based on what you submit). I will also ask that you provide a copy of your medical records and lab tests and I will go over them with a fine tooth comb. I will determine whether you have had the appropriate lab tests ordered, and make a decision of what further testing is required. In summmary, realize that your health can be optimized when you consider the underlyng factors discussed here (and in other articles in my blog) and then take action steps to rid your body of the impediments to your healing. For more details about the natural approach I take with my patients, take a look a the book I wrote entitled: Reclaim Your Life; Your Guide To Revealing Your Body's Life-Changing Secrets For Renewed Health. It is available in my office or at Amazon and many other book outlets. If you found value in this article, please use the social sharing icons at the top of this post and please share with those you know who are still suffering with knee pain or other chronic health challenges, despite receiving medical management. Help me reach more people so they may regain their zest for living! Thank you!